This past weekend I had the chance to go to the Pennsylvania Farm Show. Always held the first week in January, it brings together farmers, small businesses and family living participants from all over the state. I have gone to local fairs for many years, but this was my first time at the PA Farm Show. You can find everything at the farm show. There are a ton of amazing food stands selling everything from a basic hot dog, to fried mozzarella cheese cubes and even lamb stew. One of my favorites was the milkshakes, even on a 20 degree day! There were also a number of small business vendors selling their wares such as BBQ sauces, dips, fudge, maple syrup and other goodies highlighting PA agriculture. 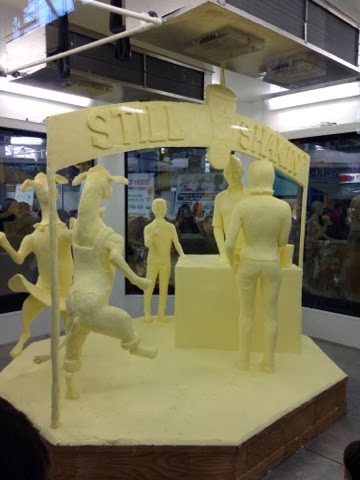 Of course you can't have a fair without the livestock, rodeos and even a butter sculpture! My favorite part of the show was to see the handmade item entries. They have categories for a variety of baked goods, gingerbread houses, knitted items, quilts, decorated gourds, wreaths, among other things. But I am always excited to see the garments. There are adult, youth and 4-H divisions. 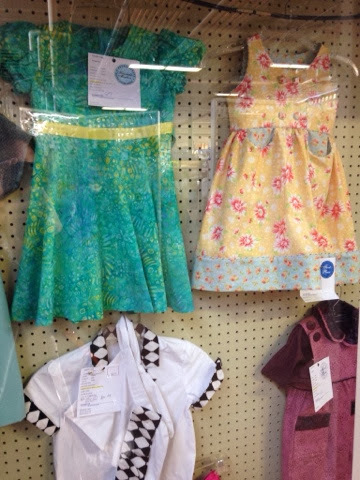 As I browse through the displays of handmade garments, I see some Fabric Mart fabric! I saw two entries from a customer that comes into our retail store as well as an entry from, I assume, a website customer. There very well could have been others but the fabric with prints are the ones that stick out to me. After taking a scan around the space looking at the fabrics, I look at the styling and technique. I was really impressed with what I saw. 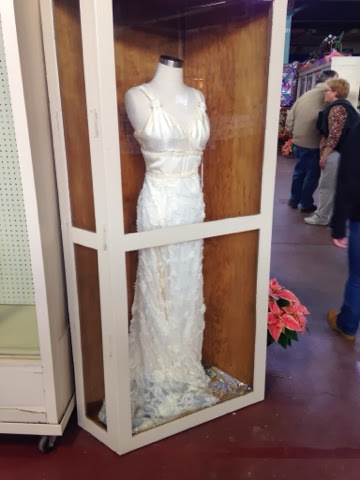 There were a number of special occasion dresses, including this beautiful wedding dress made of satin and a rosette netting. It also had beaded trim accenting the waist and front. I was really surprised to see mostly tailored garments made from woven fabrics. There were not a lot of knit garments. 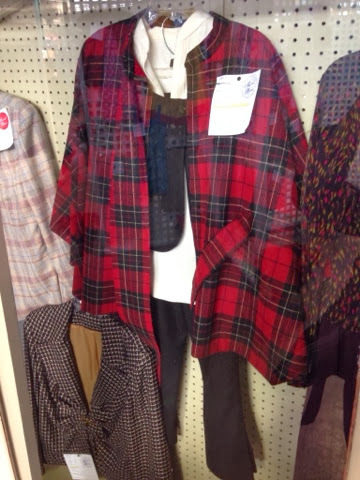 Actually, I noticed many of the garments were made from plaid fabrics. I'm sure they were submitted because matching plaids can be challenging for many sewers and they want to impress the judges! 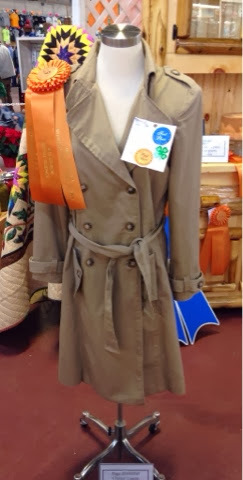 The best of show for a 4-H member was a traditional khaki trench coat. It was really well made! It included bands around the cuffs and tabs on the shoulders. All features that make it look like a ready-to-wear piece. 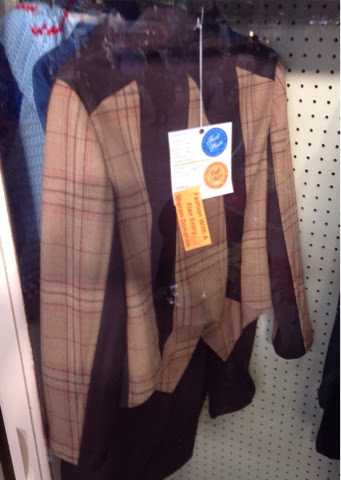 Another Best of Show garment was a plaid/solid color-blocked cropped blazer. It was really well made! Unfortunately it was behind glass so I didn't get the best picture. The children's clothes are always fun to look at. 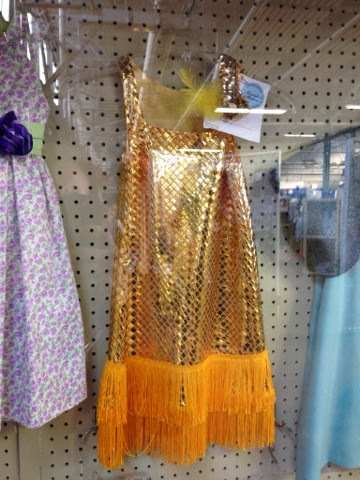 My favorite was this flapper dress. Although it was a costume, it is perfect for a flashy little girl that loves to twirl! Here is a knit top made by a customer that comes into our retail store. 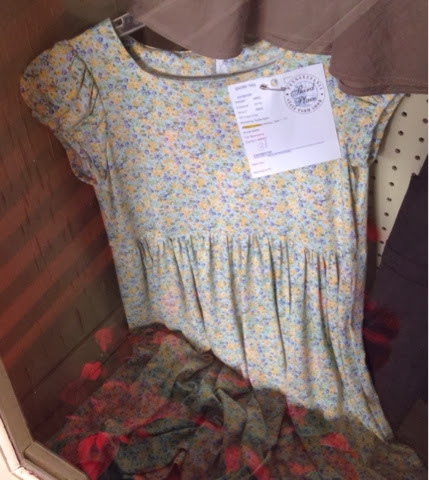 She used a tiny floral print rayon jersey from Fabric Mart! There are many county and state fairs held throughout the country. I have volunteered and entered items into the Reading Fair and Kutztown Fair since the age of 12. I take a lot of pride in participating and promoting local agriculture and homemaking practices such as sewing, cooking, canning, gardening, farming and the arts. I am not part of a farming family, but know there is a place in this country for them and support local agriculture any way I can. It is really important to pass these practices down to future generations especially because they are not taught in most schools. In terms of sewing, I learned how to sew a pillow in home economics---and that is it. Thankfully I had a fabric hoarding grandmother and a mom and aunt who took the time to teach me how to sew. I ran with it and submitted small items to the fair. I find that over the years entry participation has declined. When I first started entering items, you were really lucky if you placed. Today, I find it is a little easier because there is less competition. There could be a number of factors to why participation has declined. Why do you think this could be? So I guess you're wondering how you can submit something to a fair? Each fair will have it's own rules and ways to submit your items. Most fair associations in my area distribute a Premium Book, which may also be available online. When you first take a look at it, you might feel intimidated by the livestock and 4-H categories. Don't worry, flip through the book and you will find categories for non-farming individuals. Categories could include: home canning items, baked goods, flowers, art, ceramics, woodworking, photography, garments, quilting, crochet, knitting, needlework and more. Entering something in a fair is a great way to take pride in what you have made and to get a few dollars for doing it! I have a TON of ribbons, ranging from 5th place to 1st place. I even have one Best of Show, for a hand-woven shawl with beading. I hope you will take the time to research your local fair association and see how you can participate, whether it is to offer a few hours of your time or to submit something into the fair. You never know, you just might win a blue ribbon! Have you ever submitted a sewn garment to a fair in your area? What was your experience? What did you submit? The PA Farm Show runs January 4-11, 2014. I have in the past entered garments in the fairs as a teen and just recently started to as an adult. I teach sewing an also have a 4-H sewing club and decided to start putting things into fairs to motivate my 4-her's to do so also. My twin granddaughters also love getting ribbons on things that they have made. The Farm Show also had a Fashion Show on Saturday which was televised on PCN, I am prejudiced because one of my 4-Her's was n it, but it was great. Look it up on your local PCN channel and I am sure that it will be shown again. She didn't win a ribbon, but had a great time seeing what other made and also got motivation for this year. Thank you for sharing! I actually saw the fashion show televised right after coming back from the farm show. I was so impressed with what the girls and boys had done, some of them accomplishing things I've either only started to learn or never done at all, like making a garment out of multiple patterns. I would love to help at a 4-H sewing club one day, when I'm not traveling so much. Did you enter anything this year? I entered about 4 things in the Kutztown Fair and won 1st place in all 4. The one that I am most proud of was a quilt wall hanging of my dog. The first of it kind that I ever made and I love it. Would love to make more, just don't have the time.